We “Rajasthan Super Fillers Private Limited”, are a leading enterprise that started in the year 2007, at Udaipur, (Rajasthan, India), Supported by a team of skilled personnel, we are indulged in manufacturing the finest quality Calcium Carbonate, Dolomite Mineral, Dolomite Chips, etc. Under the management of our Mentor “Saurabh Jain (Managerment Representative)”, we have achieved reputed position in the industry. Quartz Sand Grain Super Semi we offer consists of quartz mineral, which forms SiO2 in nature. It is an important raw material, which is extensively used in glass, casting, pottery and other refractories. In our High Tech plants under the strict supervision of our quality controllers, we produce Quartz Sand Grain Super Semi of high quality having extremely low level of contaminating metal oxides and other foreign particles with the help of heavy magnetic separators in our plants, quartz sand has size 30×80 and 20×60 with low iron content. We are supplying to some of the best names of this field, across the globe as well as the domestic. 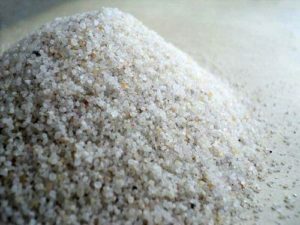 We are miners and suppliers of Quartz Sand Grain Super Semi as per the requirement . We check at it to see quality standards that our products are free of impurities. Our quartz lump are made from the best quality of quartz stone to provide required size and quality to our clients. Quartz Sand Grain Super Semi is an exportable commodity economically viable.